according to David Horsey of the L.A. Times. Horsey’s commentary reveals his Northwest roots as he corrects Shatner’s belief that the Seattle Area is a bottomless well of water. He also notes that the Cascade snowpack is at record lows this year. But he doesn’t attempt to improve Shatner’s plan by suggesting that the water be withdrawn from the Columbia River system as its headwaters are in the Northern Rockies and it is less affected by the current drought. Click here to read David Horsey’s L.A. Times commentary on William Shatner’s California Drought proposal. ENW believes Shatner’s California Drought Solution has vision, and we will add our logical improvements below. William Shatner’s proposal to pipe the Northwest’s water to drought-starved California is not such an out-of-this-world idea as some critics have implied. Energize Northwest (ENW) had been developing a solution for the California Drought for several months prior to Shatner’s proposal. Detailed engineering might lead to some other configuration, but the plan presented here shows that Shatner’s diversion concept is feasible. Water flows downhill, so logically water should be diverted from a location higher than sea-level Seattle, as Shatner proposed. Shatner proposed pumping the water south along the I5 Corridor. If he were to withdraw the water from the Columbia River behind Bonneville Dam, elevation 73 feet, he would have to pump the water up an additional 4237 feet to get it over 4310 foot high Siskiyou Pass. We suggest diverting the water from the Snake River at Brownlee Reservoir behind Brownlee Dam. The water level at Brownlee is about 2000 feet above sea level. The water will still have to be pumped up another 2700 feet to Goose Lake, on the Oregon – California border. from here the water can flow down the Pit River to Shasta Lake in Northern California, elevation 1077 feet. Formed behind Shasta Dam, Shasta Lake feeds the Sacramento River which is a key source of irrigation water in California. Shasta Dam was built by the U.S. Bureau of Reclamation to store water for its Central Water Project. The Central Valley Project uses water from the Sacramento, Pit, and other smaller rivers to irrigate 3 million acres of farmland with 6.2 km3 (that is 6.2 billion cubic meters) of water and supplies 0.7 km3 for municipal uses. Other uses, such as sustaining stream flow, bring the total to 9.1 km3 of water. The other major project is the California State Water Project which gathers water from various source in Northern California and pumps it up 2000 feet over the Tehachapi Mountains to Southern California. This project delivers about 3.0 km3 of water to the South. Together the two projects deliver about 12.1 km3 of water. Compare this to the average annual volume of the Snake River, measured above Brownlee Dam at Weiser, of 15.7 km3 or a flow rate of about 500 m3/sec. Therefor diverting the upper Snake River south, would more that the double the water available to the two California water projects. Our California Drought Solution starts by extracting the water from Brownlee Reservoir to utilize the water storage capacity of Brownlee Dam. Even starting at this elevation, about 2000 feet, the intervening topography will require pumping. From Brownlee, the water would be transported in large pipes and aqueducts through Oregon to Goose Lake on the Oregon – California border. From here the water can flow down the Pit River to Shasta Lake. The Pit River (its North Fork) used to be head-watered in Goose Lake, on the Oregon – California border. Goose Lake is a very large alkaline lake that has become landlocked and even dry (2009 & 2013) because diversions have withdrawn so much water. It is high, 4705 feet, but pumping the Snake Rivers water up to Goose Lake would revive an ecosystem that has been slowly dying for decades. As we Googled our way up the Pit River, we viewed a wide variety of stream beds as well as hydroelectric plants and irrigation diversions. Data from Wikipedia documents that the Pit’s water flow, as it enters Shasta Lake, varies from a high of 2,067 m3/s to a low of 1 m3/s with an average of 136 m3/s. Filling Goose Lake, which has a large 147 sq mi surface, would stabilize the Pit’s stream flow as we provide additional water to the California Water Projects. If we diverted the entire average 500 m3/sec flow of the Snake River into the Pit River, it would more than triple the Pit’s average flow. This would require enlarging the river’s path, especially in its upper stretches. The greatest negative economic impact of diverting the Snake River’s water to California would be the loss of electrical power that the water normally generates on its way to the Pacific Ocean. Rough calculations show that the power lost would be about equal to the output of one nuclear plant. About half of the generation loss would be to the Idaho Power Company’s three Snake River dams, Brownlee, Oxbow, and Hells Canyon. The remainder of the generation loss would be spread out over the eight Army Corps of Engineers dams on the lower Snake and Columbia Rivers. Ideally, we would like to keep all the hydro power we can, however, we need to eat and California is a major source of the produce we eat. This lost power can be replaced by the construction of one nuclear power plant at Hanford. There is an economic balance here. Northwest money goes to California to buy food and California money comes to the Northwest to pay to replace the hydropower lost by the diversion of water to grow food. In its final form, our suggested water diversion plan might not need this much energy. Any time a large quantity of water is pumped up a substantial distance, it is economical to generate electricity as the water descends. For example, the California State Water Project uses 11,500 GWh annually, but it recovers over half, 6,500 GWh, as water descends to its final destination. 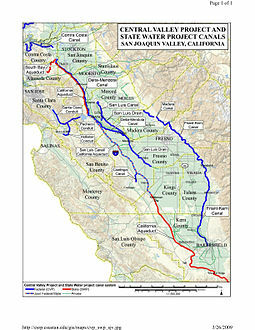 If the water were to be diverted to the Pit River, as we suggest, much of the pumping energy could be recovered by the expansion of the existing hydroelectric projects on the Pit and Sacramento Rivers. Diverting water from the upper Snake River will have fewer negative impacts than taking water from other rivers. Most of the river’s course below Brownlee is in Hells Canyon where little water is extracted for other uses. There are no salmon runs in the upper Snake as the Hells Canyon Dam blocks them. The river is free flowing from below the Hells Canyon Dam to Lower Granite Lake at Lewiston Idaho. 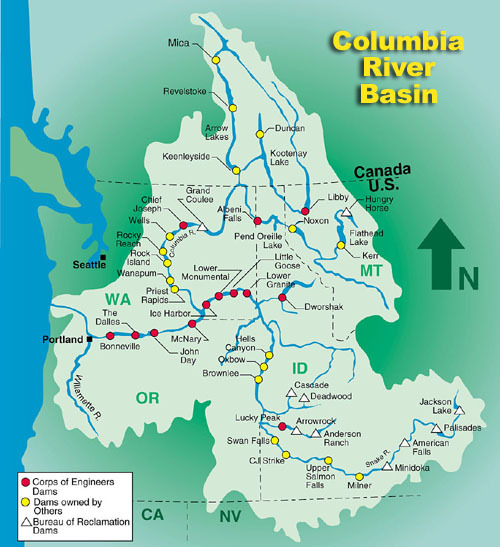 Diverting most of the upper river flow to California will reduce the river’s flow for this section but the Salmon, Clearwater, and other tributary rivers will still maintain two-thirds of the Snake’s normal flow as it enters the Columbia River. For the rest of its course to the sea, the water just flows through a series of eight artificial lakes created behind Army Corps of Engineers’ dams. Previous water diversion proposals were squelched by local officials worried about losing “our water.” However, the entire flow of the upper Snake River represents only about 7% of the Columbia’s flow into the Pacific Ocean. There will still be enough water for fish, irrigation, and shipping. The only significant loss will be a reduction in hydroelectric power generation. This was viewed as a negative in previous proposals. However, at present California water rates, California’s payments for our water would more than pay for a new Nuclear plant to replace the lost power. Climate change is a fact. We need to greatly reduce our use of fossil fuels, but that does not mean that we need to production less energy. We need ENERGY, ENERGY, and more ENERGY. Clean energy that can replace the clean energy presently generated by Snake River water. Large projects use large quantities of electric power. The existing California State Water Project, which pumps water to Southern California, uses about 5100 GWh annually, or about ½ of a nuclear plant’s output. Presently the majority of this electricity is generated by natural gas. 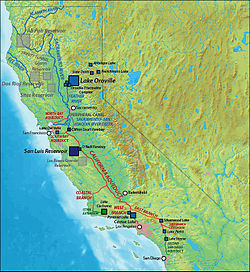 California had four (now two) major nuclear power plants. The two reactors at the San Onofre Nuclear Station have been plagued with problems and as of June 7, 2013, Southern California Edison has decided to decommission both. All four plants are located on the edge of the Pacific Ocean, near major fault lines, near populated areas, and they are showing signs of their age. Moreover, the public does not want them. Logically, California should build new, safer plants away from earthquake faults and population centers. But, for water-short California, that means away from cooling water. However, who are we to argue. Hanford is away from major population centers and major earthquake faults. If Californians want to shutter their other two plants, we could order two more plants and in about six years we could be exporting over a billion dollars a year worth of electricity to California. However, researching the California drought exposed us to the data about greenhouse gasses emitted by generating their electricity. So for the moment we will expand our discussion to include California. California generates over 120,000 gigawatts of electricity in-state with natural gas. (Natural Gas is about three times cleaner than Coal but nowhere as clean as Hydro, Nuclear, or Solar) More than half again as much is generated out of state but this power it not identified by fuel source. Together this represents about half of the electrical energy used in California and generating it produces over 20% of California’s greenhouse gasses (GHG). Construction of 10 to 15 large nuclear plants would completely eliminate 20% of California’s GHGs. This step to reduce California’s emissions is a no-brainer but we see little action toward its implementation. The construction of 10 to 15 reactors may seem inconceivable to some, but back in the 1970s and 80s, we built most of the 110 reactors operating in the United States today. During this period Illinois built 11 reactors which are still operating. In the five-year period, 1984-88, Illinois brought seven reactors online. So the construction of 10 to 15 in 10 years is a reasonable construction schedule. In checking on the construction dates of Illinois’ reactors we noticed that they provide an emission-free source for almost half of the state’s power. Sadly, the other half is produced by the most polluting fuel known, coal. As we were typing this, we were watching Chris Hayes on MSNBC doing a report on Solar Power. We have nothing against Solar but we recognize its limitations. Since the water is in no rush to get to California, you could pump water only when the sun is out. However, because of its intermittent availability, you will have to install pumps and piping three times larger than you would need if using 24 hour-a-day available nuclear power. For more information on how our energy policy affects global warming climate change go to our home page, Energize Northwest. Note: We just published this page 7/14/15 and noticed that the theme does not allow for a Reply. We will fix it, but for the moment use our Contact Us page to comment.